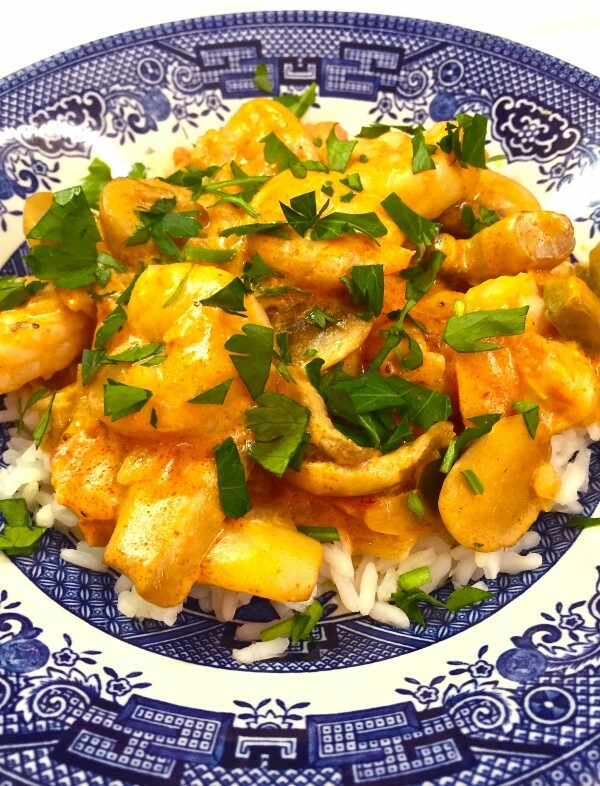 Shrimp Creole is a classic dish of Louisiana Creole origin consisting of cooked shrimp in a mixture of diced tomatoes, the holy trinity of onion, celery and bell pepper, spiced with cayenne-based seasoning, and served over white rice. 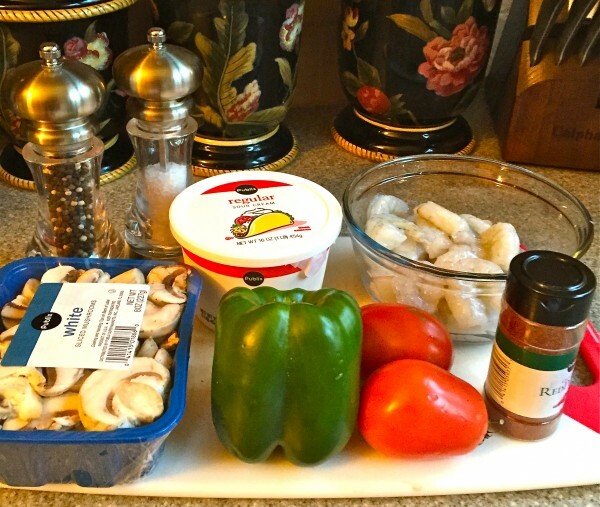 This Creamy Shrimp Creole recipe adds sour cream and mushrooms which only increases the level of deliciousness of this classic dish and makes it absolutely the best Shrimp Creole I have ever tasted. Think about it, succulent briny shrimp drenched in a creamy spicy tomato sauce with tender mushrooms, peppers and fresh tomatoes…it just can’t get much better than this! Almost two years ago we spent the weekend with a college fraternity friend of my husband’s and his wife, at their beach condo in Ponce Inlet. Jim and Cheryl were wonderful hosts and we had a terrific time visiting with them, and seeing the area. We even drove over to Gainesville for a UF football game, my husband’s alma mater. 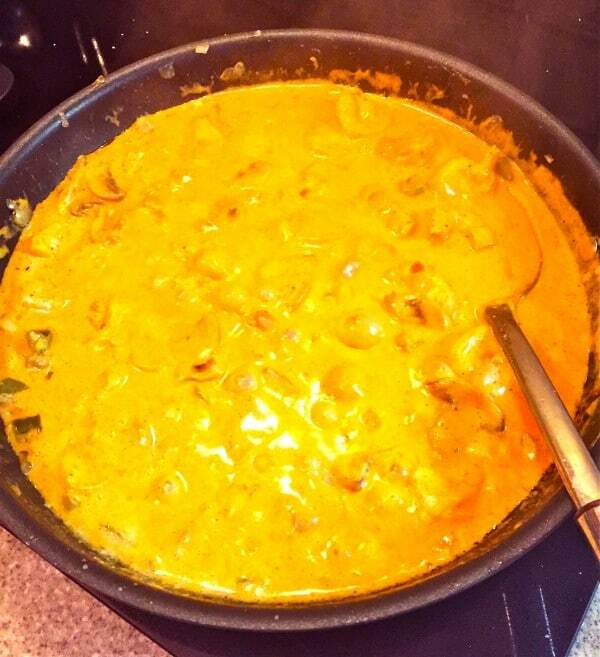 Cheryl is a fabulous cook and she prepared this Creamy Shrimp Creole dish for dinner one night. It was absolutely delicious and I’ve been hoping she would share the recipe ever since. And, here it is! I’m thrilled that I can share it with you and hope you enjoy it as much as we do! 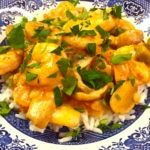 It’s easy, it’s quick and it would be a great dish for either a weeknight family dinner or to serve to company. I promise you will get rave reviews. 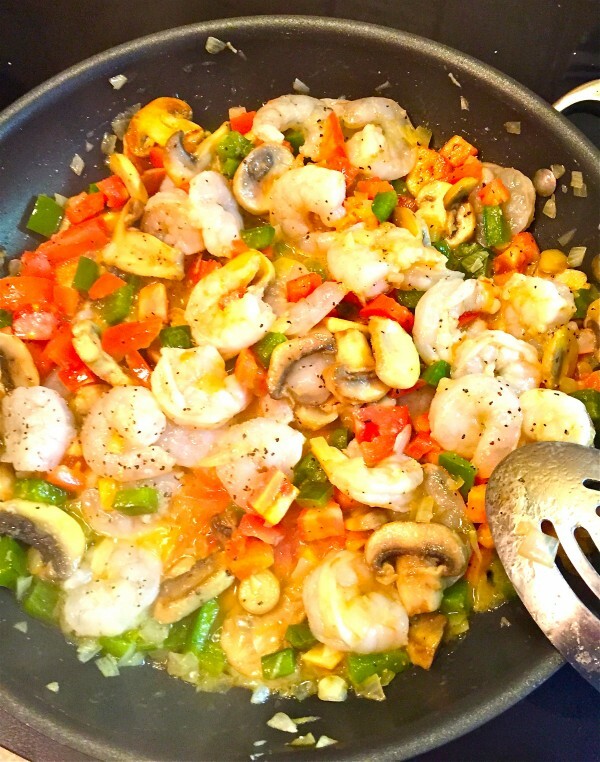 To get started, gather your ingredients, which are shrimp, sliced mushrooms, garlic, green pepper, onion, butter, sour cream, salt and pepper, cayenne pepper, plum tomatoes and tomato paste. 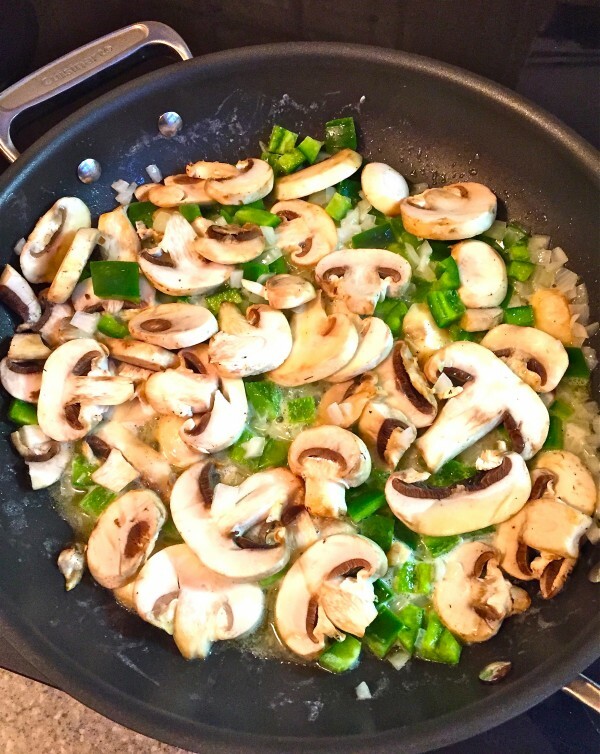 Saute the mushrooms, onion, garlic, and green pepper in butter, in a large skillet over medium heat for approximately 5-7 minutes, or until the vegetables are tender. Lightly season with salt and black pepper. Stir in shrimp and tomatoes, cook about 5 minutes, or until the shrimp are pink and cooked through. Stir in sour cream, tomato paste and cayenne pepper. (Add 1 tsp cayenne pepper and taste. If you like it spicier, add another teaspoon.) Mix well and continue to cook for approximately 2-3 minutes or until the mixture is bubbly. Serve over hot cooked white rice with a salad and French bread. Enjoy! Stir in sour cream, tomato paste and cayenne pepper. (Add 1 tsp cayenne pepper and taste, if you like it spicier, add another teaspoon.) Mix well and continue to cook for approximately 2-3 minutes or until the mixture is bubbly. Serve over hot cooked white rice with a salad and French bread. Enjoy! Do you like the recipes on Grits and Pinecones? Never miss out on a fabulous new recipe or meal idea again. Sign up to have my posts sent right to your email inbox! It’s easy as pie! Just enter your email address in the Subscribe box at the top right-hand corner of this page. That’s all there is to it! If you like this recipe, please share it with your friends on Facebook, Pinterest, or Twitter! Thanks for visiting! I hope you try the recipes and I hope you come back soon!